In a ground breaking development, fifty leading representatives of almost every faith community in the United Kingdom have signed an open letter, addressed to the Rt Hon William Hague MP, the Foreign Secretary, requesting him to call for the release of the seven former members of the Yaran (“the Friends in Iran”) and for the freedom of all the followers of Bahá’u’lláh in the Cradle of the Faith. The letter was received on 14th May - the fifth anniversary of the incarceration of the former members of the Yaran - at the Foreign and Commonwealth Office in London on the Foreign Secretary’s behalf by Alistair Burt MP, Minister for the Middle East and North Africa. Among the signatories of the open letter, a copy of which is attached, areThe Most Revd Dr Barry Morgan, Archbishop of Wales, The Right Revd and Rt Honourable Dr Rowan Williams, former Archbishop of Canterbury, The Most Revd Bernard Longley, Roman Catholic Archbishop of Birmingham, The Chief Rabbi Lord Sacks, Mr Vivian Wineman, President of the Board of Deputies of British Jews, Shaykh Ibrahim Mogra, former General Secretary of the Muslim Council of Britain, Maulana Shahid Raza, Chairman of Imams and Mosques Council, The Right Revd Albert Bogle, Moderator of the General Assembly of the Church of Scotland, The Most Revd David Chillingworth, Primus of the Scottish Episcopal Church, Venerable K Sri Rewatha Thero, Chief Monk for Great Britain (Theravada Buddhist), His Grace Bishop Angaelos, the Coptic Orthodox Church Centre, Lord Singh of Wimbledon, Network of Sikh Organisations, Dr Natubhai Shah, Founder Chair of the Jain Network, andMr Swaminathan Vaidyanathan, Acting Secretary-General of the Hindu Forum of Britain. A full report of yesterday’s meeting at the Foreign Office can be found on the UK Bahá’í News website or on the Five Years Too Many campaign website. It is the hope and prayer of the National Spiritual Assembly that this gesture of unprecedented solidarity and support from distinguished people of faith in the United Kingdom will serve to reinforce the calls from growing numbers of governments, parliamentarians, civil society groups and individuals throughout the world for the emancipation of the sorely-tried believers in Iran who continue to inspire and astonish countless millions as a result of the exemplary courage, fidelity and fortitude they have demonstrated in the face of the bitterest of persecution. 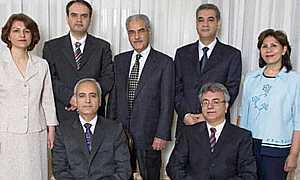 Five years ago, the Iranian government imprisoned seven former leaders of the Bahá’í community for no reason but their beliefs. Today, we - leaders of the United Kingdom’s diverse faith communities - are calling on you to renew your support for these seven prisoners and all members of Iran’s long-suffering and largest religious minority, the Bahá’í community. Iran has abandoned every legal, moral, spiritual and humanitarian standard, routinely violating the human rights of its citizens. The government’s shocking treatment of its religious minorities is of particular concern to us as people of faith. The United Nations Special Rapporteur on Iran’s human rights situation, Dr Ahmed Shaheed, recently reported that members of religious minorities have suffered arbitrary arrests, unlawful trials, imprisonment and torture. Places of worship, businesses and homes are ransacked; students are barred from university because of their faith; cemeteries are desecrated. And in addition to Bahá’ís, other persecuted minorities include the Gonabadi Dervishes, themselves Shia Muslims; the Yarsan, a Kurdish religious minority; and even Christians, despite that faith’s constitutional protection. The state-sponsored persecution that has plagued the Bahá’ís for decades is an egregious example of Iran’s violence against minorities. In the case of the seven former leaders of the Bahá’í community, Iran violated its own due process; the prisoners were held without charge for over a year and then paraded before Ministry of Intelligence cameras in trials that excluded outside observers. They were finally each sentenced to 20 years in prison. These seven Bahá’ís must now be released. On this, the fifth anniversary of their arrest, we ask you to voice again your call for their freedom and the freedom of all Bahá’ís in Iran. The Bahá’ís wish to serve their country, the land in which their faith was born, and they have the right to work for its betterment without fear of reprisal. Emancipation for the Bahá’ís is long overdue.